Pikas, those furry little mammals that scurry and skitter between rocks at high elevations, are being studied as a model organism for avoiding temperature stress by a pair of University of Wyoming researchers. Pikas may be more resilient than once thought. Because they neither migrate nor hibernate like most alpine mammals, pikas have learned to adapt to extreme weather changes, which can happen daily, as well as seasonally, at Wyoming's high elevations. If temperatures get too hot during the summer, pikas seek shelter under the shade of rocks. When it's cold in the winter, they use snow tunnels for insulation and forage on the hay they gathered and piled during warmer months. "In general, they can alter their active time," says Embere Hall, a University of Wyoming Ph.D. candidate in the Department of Zoology and Physiology. "In the middle of summer, when it's hot out, they may be more active in the morning or the late afternoon. What we are looking at is how they balance the time they spend looking for food and using shelter to avoid heat stress." For the past two and a half years, Hall has studied the American pika in three Wyoming mountain ranges – the Gros Ventre Range, the Wyoming Range and the Snake River Range—all located within the Bridger-Teton National Forest. Pikas are listed as a "species of greatest conservation need" in Wyoming. Anna Chalfoun, a UW assistant professor of zoology, and assistant unit leader of the Wyoming Cooperative Fish and Wildlife Unit, is Hall's faculty mentor. "Pikas are fascinating on many levels. It's maybe the only wildlife species that stays put the whole year in these alpine environments," Chalfoun says. "They're particularly useful to study because they have a wide range of behaviors in response to their environmental conditions. They have a narrow thermal tolerance." 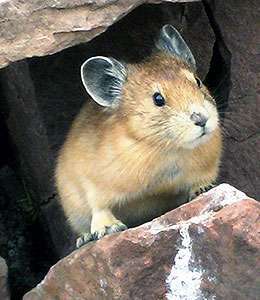 A pika is a small mammal, with short limbs, rounded ears and no visible tail. It also is known as the "whistling hare" due to a high-pitched alarm call it emits when diving into its burrow. "They are mistaken as rodents, but are actually related to rabbits," Hall says. "They weigh six ounces and would fit in the palm of most people's hand." Because they are so small, pikas are near the bottom of the food chain, and have to be aware of predators, including fox, coyotes, weasels and owls, Hall says. To protect themselves from predators, pikas make alarm calls to alert other pikas. Pikas are native to cold climates and most species live on rocky mountain sides, where numerous crevices are used as shelter. They are found from northern New Mexico into Canada. As herbivores, they feed on forbs, grasses, sedges, shrubs, twigs, moss and lichen. "They can only forage when there are plants on the ground. There is no way for them to do that when there is snow on the ground," Chalfoun says. As a result, pikas, much like squirrels, store food during the summer in preparation for winter, Hall says. To do this, they create large hay piles on top of rocks. During the winter, pikas live in sub-nivean tunnels, which are located in the snow between the ground's surface and the top of the snowpack. They feed from the hay as well as use it for insulation. Some of the plants they gather contain phenolics, which are compounds toxic to other animals. "Pikas figured out how to co-opt that as a way to preserve their hay pile," Hall says. "If pikas can adjust behaviors that affect survival—such as foraging—in response to extreme temperatures, then it may signal hope for other species with similar life history characteristics." Through footage captured on strategically-placed trail cameras—approximately 3,500 videos to date—Hall and Chalfoun have been able to see the time of day pikas are active; the size of their food loads; and how many trips they make to their hay piles. Perhaps the most interesting video captured occurred at night. "To the best of our knowledge, this is the first evidence of pikas caching food at night," Hall says, pointing to footage of a pika ascending a hay pile in darkness. By surveying 199 sites in the three mountain ranges, the two also collected temperature data using small sensors placed on rock surfaces and in subterranean climates. They found pika activity at roughly 58 percent of the sites, Hall says. "Pikas are kind of like Goldilocks," Hall says in reference to the storybook character's temperature preference for porridge. "They don't like temperatures that are extremely cold and they don't like when it gets really hot out. They like it just right." Based on the research, the two have concerns that climate change and less snowpack has led or will lead to more pikas moving to higher elevations to access cooler temperatures during summer months. Chalfoun's primary concern is that high elevation soils are slow to develop and, thus, may not support enough of the plant life that pikas need. Consequently, there may be a future mismatch between the elevations that provide the temperatures that pikas require, and the food resources available to them at those elevations. On the flip side, Hall, in what she terms her "microrefugiae hypothesis," says less snowpack at lower elevations would provide less snow cover or insulation for pikas and create a colder environment. This could lead to pikas seeking higher elevations in winter because the snow cover there would provide warmth and more stable temperatures for the small mammals. Hall says information generated from the study will have direct implications for species' conservation designations and ongoing prioritization efforts, including species' rankings in the State Wildlife Action Plan, which the Wyoming Game and Fish Department maintains and is currently revising. "We're still working on our project," Hall says. "We don't have final results." Hall will present her research at the 3rd Conference of the North American Pika Consortium in Golden, Colo., April 17-18. Hall co-founded the group in 2010. She and Chalfoun recently submitted a paper on their research findings to the journal Ecography.